The new year offers a special opportunity for students to take a step back and reevaluate their financial habits. Financial literacy is built one budget at a time, so it’s a good idea to make the first budget of the year a successful one. 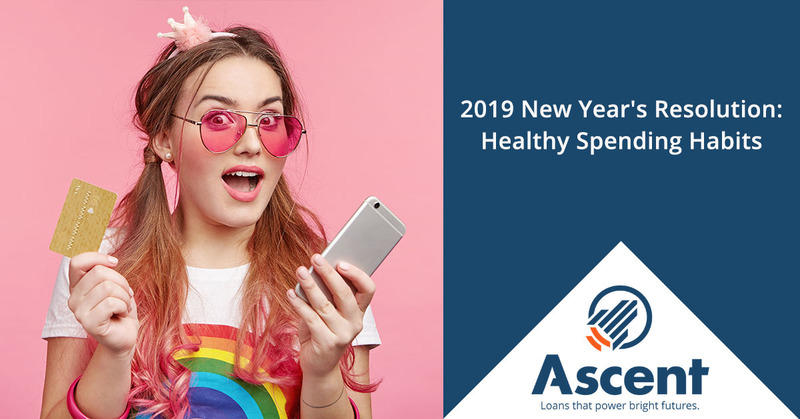 To keep your budget balanced into 2019 and beyond, we’ve compiled this list of healthy spending habits that can help you to save money in the new year. One of the first places to check when it comes to starting the year off right are your recurring expenses. Do you have a game subscription you could let go of, or a cell phone bill that could be discounted? Take stock of all your monthly expenses to get a grasp on where your money is headed. You may be surprised that seemingly innocuous expenses can really add up—look back at your 2018 budget and see where you could improve in the spending department. More and more services are open to shared subscriptions. Check out if your cell phone plan is eligible for a group discount when partnering with family or friends. Prepare meals and coffee at home—eating out can be one of the biggest expenses for college students. Learning some basic cooking skills can make a big difference in the pocketbook! If you look back at the previous year’s budgets, you may find that you made some mistakes or omitted some information. Remember that your budget should be as detailed and thorough as possible. You want to know where your money is going, as we learned in Budgeting Tips for the School Year. This New Year, make it a point to keep better budgets. It can be hard to put money away when it seems like our budgets are already stretched. In this case, automatic savings programs that regularly stash away some funds can help you to build your savings, because you no longer must choose between saving money and buying a fancy meal: the savings are done automatically. You may be surprised by how much your savings can add up when you have regular, recurring deposits go straight into a savings account. This is also a great way to build up your emergency fund if you haven’t built yours up yet. Many institutions have recognized the need for more affordable textbooks and school supplies. Look into any lending programs at your school library or see if there’s an affordable web-based option for getting a hold of your curriculum. You may save a lot of money compared to a standard, printed textbook. Missing even one bill payment not only can lead to late fees but can also start a snowball effect that makes it easy to fall behind. Make it a point to get your bills paid on time, every time. Set up automatic payments to make sure you don’t miss a due date, and use electronic bill pay services to take care of them at lightning speed. When it comes to student loan payments, regular on-time payments can open up benefits such as the ability to ditch your cosigner. This New Year make a resolution for an entire year of on-time payments! One of the most important factors of a healthy financial life is a proper perspective about money. When we turn to just spending money to find happiness, we can overlook some of the more rewarding ways of spending our free time. Working on a new skill such as playing a musical instrument or competing on a sports team will give value to your life in a way that you won’t find by buying the latest clothes and gadgets. Paradoxically, those who can find happiness without money tend to have more of it around when they need it. This is because saving and investing extra cash—rather than spending it all right away—allows you to build up a sufficient emergency fund and keep your financial future on track. College is a time when we have an opportunity to discover our true potential. 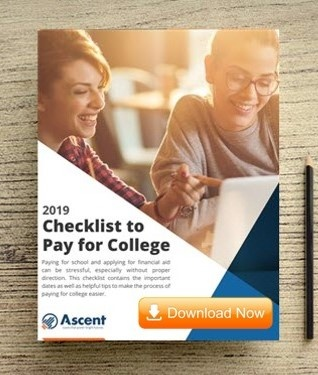 At Ascent, because student loans are a labor of love, we hope to provide students with the resources and information they need to succeed throughout their college years and beyond. Be sure to check back with our blog section often to find the latest and greatest college finance tips. Wherever you hope to go with your studies, Ascent has your back along the way.